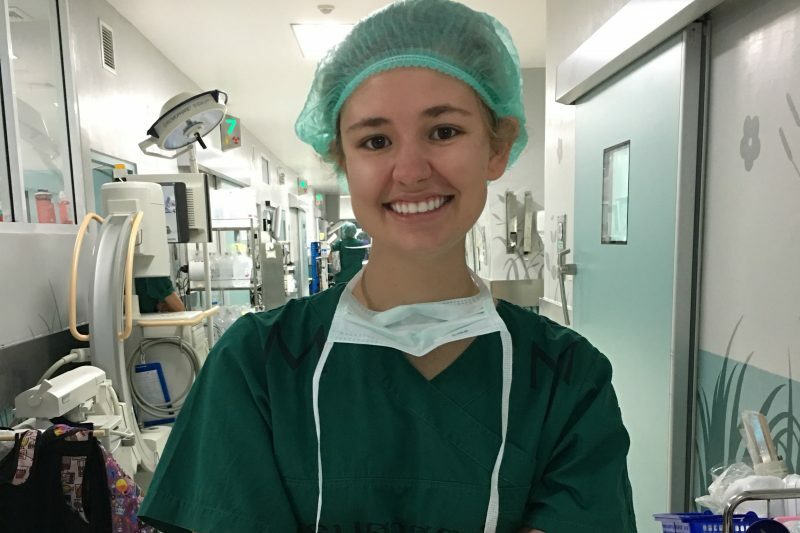 ‘My Time in Thailand’ Shadowing surgeons in Thailand made neuroscience major Emily Ellis '18 even more excited about her chosen career path. I traveled to Thailand this summer and worked as a medical intern for one month. As a medical intern, I assisted with basic medical needs, observed doctor-patient interactions in the outpatient department, and viewed surgical procedures inside the operating rooms. I had a truly global experience, meeting doctors and patients from all over Asia and living with volunteers from 10 different countries. This experience was funded by a Johnson Opportunity Grant. My time in Thailand was divided between Chiang Mai and Bangkok. Chiang Mai is a city with an incredibly relaxing atmosphere and easygoing pace of life. It is large enough to offer visitors anything they want but small enough for them to navigate. What I love most about Chiang Mai is the kindness and authenticity of the people. Because of its size, Bangkok is initially intimidating and overwhelming, but the hospitable people and impressive infrastructure make it easier to tackle. After becoming accustomed to the bustling city, it is easy to enjoy everything it has to offer. What I loved most about Bangkok is its innovation, especially in the hospitals. I worked from 8 a.m.-4 p.m. Monday through Friday. At the hospital, I either completed rounds or observed surgeries. When completing rounds, I met the patients in my assigned department and learned the details of their cases. Sometimes, the patients spoke English well enough to tell me about the case themselves. When I was observing surgeries, the surgeons would explain the case and procedure as the patient was being prepped. Once the surgery began, the nurses helped me find the best view of the procedure. Occasionally, the surgeons asked me to scrub in. The surgeries ranged from 30-minute C-sections to 7-hour open heart or brain surgeries. I would not have the experience I had without the amazing individuals I encountered in Thailand. I formed lasting friendships with Thai coordinators and medical students as well as volunteers from from all over the world. We were united by our desire to learn about new cultures and found ourselves constantly discussing custom foods, holiday traditions, and current events in our native countries. With this exposure to a variety of new cultures, I improved my ability to identify cultural schemas and attribute cultural differences to these schemas as opposed to viewing one culture as superior to the other. It was difficult adjusting to the language barrier. The doctors and nurses had better English than I expected, but they got offended if I corrected their pronunciation or asked them to repeat their sentences. I learned it was usually best to smile and nod, then ask for clarification following the explanation. There was one time when that was not the best approach. A surgeon was explaining a procedure to his medical students and me. He was speaking in English but suddenly looked at me and started speaking Thai. I simply smiled and nodded, but the surgeon continued repeating the phrase to me. As I continued to smile and nod, a medical student informed me that the surgeon was asking if I had a pen. For the past 30 seconds, I had unknowingly been answering yes but never reached to give him one. I had several doctors and nurses serving as my mentors this summer, and while each one provided me with a wealth of medical knowledge, I most appreciate their direction on how to act appropriately in a new culture. By imitating their behavior, I could act professionally, receive more responsibility, and recognize cultural differences in technique and conduct. In addition to the medical background I learned with my W&L curriculum, W&L prepared me for the type of culture I would encounter in Thailand. There is a reason Thailand is called the Land of Smiles. The people are exceptionally friendly and considerate. I could not help but notice the similarities between our warm W&L community and the compassionate communities in Chiang Mai and Bangkok. I particularly valued their willingness to help, their appreciation for my attempt at speaking Thai, and the interest they showed in my story. I hope to carry the endless smiles and cheerful energy to W&L so that I can become even better acquainted with our community during my last year. Not only did this experience validate my desire to practice medicine, it gave me insight into which departments I want to pursue in the future. As a neuroscience major, I have always considered neurology or neurosurgery, and after observing several complex neurosurgeries, I am even more swayed, but I also have a new love for cardiology after watching two incredible open-heart surgeries. Any type of abroad experience can offer opportunities for personal growth and broadened perspectives, but working abroad is unique in that it places students directly alongside foreign community members. As a result, students who work or volunteer abroad have greater access to the culture and greater opportunity for meaningful relationships with community members, especially because they arrive with something to offer to the community rather than just something to learn. If nothing else, working abroad advances future career opportunities by providing individuals with incredible professional experience and perspective.